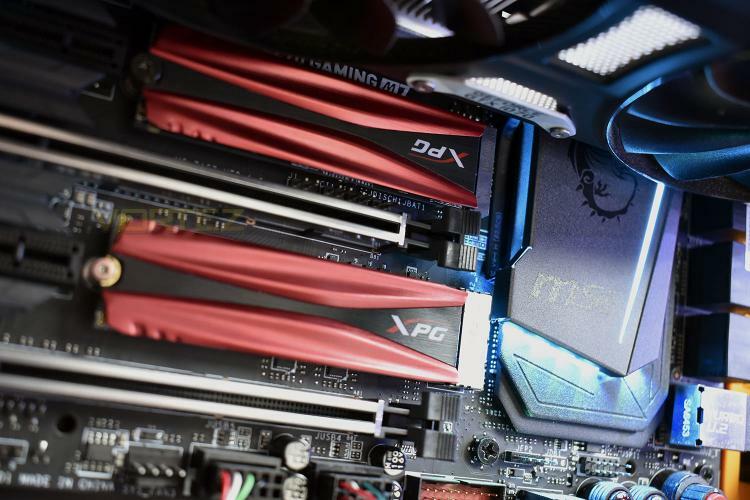 If you remember back to August last year, we looked at the ADATA XPG Gammix S10, a very capable NVMe M.2 SSD that struck a great balance between cost and performance, however, more recently, XPG have shown their hand with the SX8200 which we reviewed in April; this SSD put the cat amongst the pigeons, offering 95% of the performance of a similar capacity Samsung EVO or PRO drive at 60% of the cost. Following on from those two drives, we have the opportunity to test the XPG Gammix S11 drive, fitted with a full-length black and red heatspreader to help alleviate thermal throttling and other heat-induced issues. The Gammix S11 employs a PCI-E Gen. 3 x4 interface to allow speeds up to 3200MB/s read and 1700MB/s write while conforming to the 2280 M.2 form factor. Due to the use of 2nd generation 64-layer 3D NAND flash, higher capacities have been achieved, as well as better longevity and reliability. XPG claims the black and red heatsink is capable of reducing temperatures by up to 10°C which helps maintain peak performance during demanding read and write tasks, while SLC Caching, a DRAM Cache Buffer and LDPC ECC technologies work away in the background to ensure everything works the way it should. The SX8200 impressed us greatly in April, offering a drive of incredible value and amazing performance, so hopefully we can see similar from XPG this time around. The GAMMIX S11 M.2 2280 NVMe 1.3 SSD is our fastest SSD to date. It employs the extra-fast PCIe Gen3x4 interface and provides stunning R/W speeds of up to 3200/1700MB per second, outpacing SATA 6Gb/s by a huge margin. Implementing 2nd generation 64-layer 3D NAND flash, the S11 also features higher capacities and greater reliability than ever. The S11 is covered by a slim, cool black and red heatsink with the XPG logo which reduces the SSD's temperatures by up to 10°C for excellent cooling. With SLC Caching, a DRAM Cache Buffer, and LDPC ECC technologies, it maintains high speeds and data integrity during even the most intense gaming, rendering, overclocking, and other high demand applications.